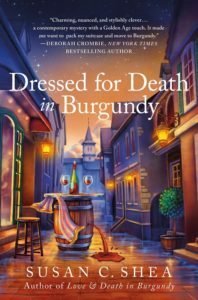 A new French Village mystery for Francophiles! And, Love & Death in Burgundy is still winning applause. 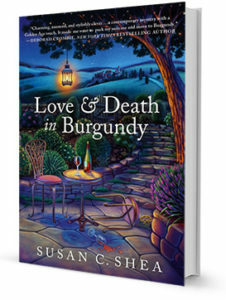 From critically acclaimed author Susan C. Shea comes Love & Death in Burgundy, an atmospheric mystery novel filled with good Chablis, French cheese, and, of course, murder. After three years of living in the small town of Reigny-sur-Canne, all Katherine Goff really wants is to be accepted by her neighbors into their little community. But as an American expat living in the proud region of Burgundy, that’s no easy task. When the elderly Frenchman who lives in the village chateau is found dead at the bottom of a staircase, the town is turned into a hotbed of gossip and suspicion, and Katherine suddenly finds herself drawn deeper and deeper into the small town’s secrets. A motherless teenager, a malicious French widow, a brash music producer, and a would-be Agatha Christie are among those caught up in a storm that threatens to turn Katherine’s quiet life upside down. As more and more of the villagers’ secrets are brought to light, Katherine must try to figure out who, if anyone, in the town she can trust, and which one of her neighbors just might be a killer. Susan blogs every other Monday on the Criminal Minds blog. Susan C Shea, Author shared a link.